BelarusDigest > Myths > Are Belarusians fundamentally rural Orthodox Christians? Are Belarusians fundamentally rural Orthodox Christians? The vast majority of the Belarusian population is urban - only 25 percent live in rural areas. The vast majority of the Belarusian population is urban – only 25 percent live in rural areas. 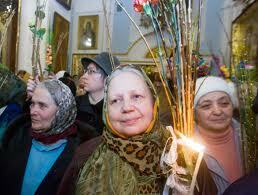 Most residents of Belarus are not religious. Although the majority would say they are Christian Orthodox, they usually neither go to the church nor observe religious rites. As far as active believers is concerned, the difference between the number of Orthodox Christians, Roman Catholics and Protestants is likely to be insignificant. The state clearly favours the Orthodox Church, which is subordinate to the Moscow Patriarchy. The Orthodox Church clergy often openly backs the authoritarian regime in Belarus and in return they receive preferential treatment. The Russian Orthodox Church predominately uses the Russian language for their services. Roman Catholics constitute the second largest denomination. They are cautious in their affairs with the official authorities, which in turn treat them with tolerance. Catholics predominantly use Belarusian in their services but in Western Belarus many parishes use Polish. The number of Christian protestant communities has grown dramatically since the early 1990s. The authorities do not regard protestants as a 'traditional' religion in Belarus and often create obstacles for their activities, which even include arrests for 'unauthorized' religious services.